I just told you everything you need to know about the movie’s plot. In fact, I don’t think spoilers are even possible for a movie like this. If you’ve seen Dances with Wolves I or II, you already know what happens. American soldier becomes involved with the technologically inferior enemy culture he is fighting. He learns the superiority of their ways. He falls in love with a local lass. He earns the trust of the natives and switches sides to fight against his own countrymen. The audience cheers him on as he assaults the very foundation of their civilization. It was good stuff the first time around. And the second. But now that Dances with Wolves III is out, all the characters are shallow cliches, the dialogue is bland and expected, and the plot holes are widening into gaping chasms. But you aren’t interested in this movie for the plot, are you? I sure wasn’t! I had come to see the much-hyped special effects. In this department, the movie doesn’t disappoint. It’s pretty spectacular, which it had better be, since the budget of Avatar was greater than the GDP of several small island nations such as Palau (true story). If you want the full eyeballs-on-fire effect, you’ll want to see it in 3D, like I did. That’s the theory, anyway. The reality, as I learned when watching Up, is that you don’t even notice the 3D effects after the first five minutes or so. So there’s really no point. Save a couple of bucks and go for the 2D edition. If you’re feeling generous, you can give me those two bucks. I promise to spend them wisely (on ice cream). Even interstellar militant hippies use Crest Whitestrips®. 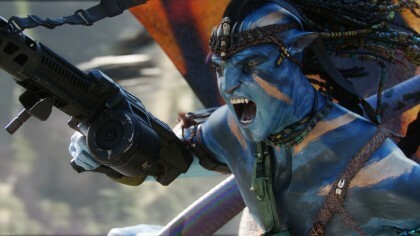 Avatar definitely blurs the line between reality and CGI until you can’t tell the difference between the two. It also tries to blur the line between reality and propaganda, though less successfully. When the evil human colonel announces that he plans to “fight terror with terror” and drive out the natives with a “shock and awe” campaign, it’s fairly obvious what message Cameron is trying to send. The American imperialists are a bunch of environment-wrecking, native-massacring brutes who are no better than the terrorists whom they fight. Apparently Cameron had been working on this movie for ten years. If this was the most intelligent, nuanced message that he could put together in all that time, you’ll have to forgive me for dropping him a few notches in my “top creative minds” list. This is after he already dropped a few notches for a crappy plot. Papyrus: cool like wearing Puma shoes. All right, we’ve gotten past the important stuff, so now let’s waste time on a minor quibble. 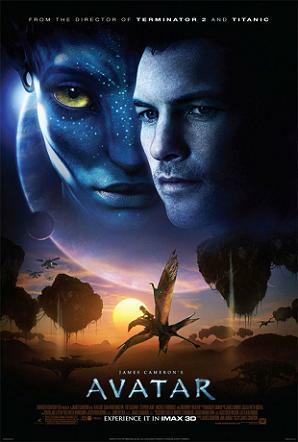 Whenever the natives (the Na’vi) talk in their own language, the movie helpfully offers subtitles…in Papyrus font. This is kinda dorky, but I hate Papyrus font. It’s almost as bad as Comic Sans. It’s always used whenever a document is meant to look “ancient,” but it only makes it look hokey and low-budget because everybody uses that font for everything. It should not be used anymore, forever. So that’s my helpful tip of the day. If you hadn’t already given me two bucks earlier in this review, now would be a good time to do so. And Avatar gets $$¢ (two dollars and change). If you’re still interested in seeing the movie, don’t wait until it comes out on DVD (or Blu-ray, if you’re rich). You’ll want to watch this on as big a screen as possible. Good review. You should do that for a living – writing movie reviews – if your real occupation somehow falls through. I will probably enjoy your review more than the movie itself…. Dang it, looks like my GDP joke was already used three days ago! What a tool I am! Did you happen to see these reviews? When (if?) I do see the movie it’ll be primarily for the special effects! is it bad that I own Dances with Wolves 1 & 2?